Why the COFEM Feminist Pocketbook? Sometimes it can be hard to find accessible, non-academic resources to help people working in humanitarian and development settings understand and implement feminist approaches to addressing violence against women and girls, and empower them to promote women-centered GBV theory and practice. To build the conﬁdence and competence of practitioners, researchers, policy-makers and other advocates, COFEM has developed the Feminist Pocketbook – a series of short, easily digestible tip sheets. What is COFEM’s Feminist Pocketbook? What is a feminist perspective and why is it important? While there are many different feminisms that bring diversity and richness to the women’s rights movement, a fundamental and shared feminist perspective is that the problem of VAWG is grounded in gender hierarchies and gender inequality—that is, it is gender-based. A feminist perspective emphasizes individual and collective empowerment of women and transformation of the social and structural dimensions of women’s inequality and subordination. A feminist perspective is essential for understanding and dismantling the underpinning systems of power, especially gender inequality, that produce, reinforce and perpetuate GBV. Who is the Pocketbook for? The Pocketbook is for everyone! But it particularly speaks to (and has recommendations for) practitioners, researchers, policy-makers and donors working to prevent and respond to GBV in development and humanitarian settings. We hope the Pocketbook will help GBV colleagues engage more effectively with key stakeholders on the importance of a feminist-informed approach to addressing GBV. How to use this Pocketbook? Share, share, share! The Pocketbook is a tool that practitioners can use in program implementation, as well as when advocating with key stakeholders, partner organisations, policy-makers and donors. As a whole, the Pocketbook wonderfully illustrates how many of the challenges we face are interlinked. It can be used in its entirety to provide an overview for understanding and implementing a feminist perspective in GBV work. Additionally, individual tip sheets can be shared and used to guide GBV work around specific issues. 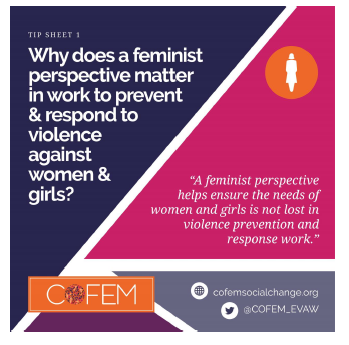 Tip Sheet 1: Why does a feminist perspective matter in work to prevent and respond to violence against women and girls? Tip Sheet 2: Why does GBV programming focus on women and girls? Tip Sheet 9: Backlash: What is it and how do we address it safely?